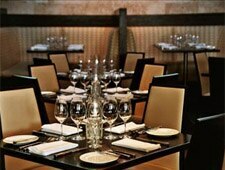 World-class 10,000-bottle wine cellar and contemporary seasonal cuisine. : You’d think from its name that hush would be one of those quiet fine-dining spots where everyone talks in whispers. But don’t expect the silent treatment here because hush is actually quite the noisy place for hipsters to hang. Laguna denizens are drawn to the food and service provided by longtime manager Daniel “Danny” Reyes and owner Chuck Rock, who donated his world-class 10,000-bottle wine cellar at the restaurant’s opening back in 2003. The minimalist décor is warmed by dark woods, cream-colored furniture and tons of candles everywhere. Original chef Ronnie Arnold has returned to bring his contemporary, yet rustic comfort food back to Laguna. Start with the pricey caviar service, which features white sturgeon or golden osetra, plus all the traditional accoutrements. Or, begin with the signature macaroni and cheese with lobster, crayfish, black truffle, leeks and a lobster cream sauce. Chef Arnold excels with his seafood dishes, so try the tender Alaskan halibut, Australian lobster tail or the seared scallops with fava beans, potato mousseline and caramelized lemon jus. Fortunately, the Prime beef flat-iron steak is still on the menu. For dessert, order the sweet strawberry shortcake or the satisfying chocolate molten cake with berry coulis and vanilla bean gelato.